The Island of Gaiola (Isola della Gaiola) looks beautiful and serene. However it has a gloomy history and the locals feel that the island is jinxed as many past owners of the sole villa on the island had faced misfortunes and/or met with unnatural death. The villa now lies abandoned. 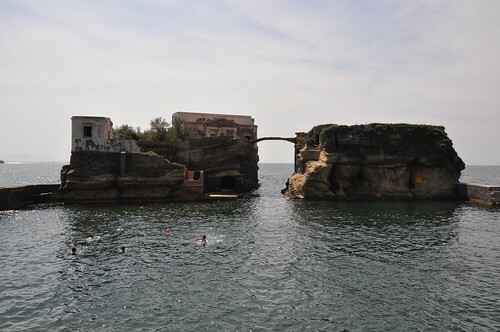 The island which is located on the southern edge of Posillipo, along the Gulf of Naples is actually group of two very small islets very close to the coast. 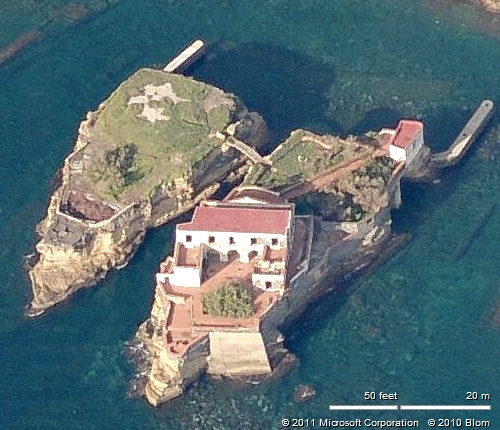 One of the islet has a large residential villa and the second islet which lies within few metres of the first is uninhabited and connected to the first by a small rocky arch bridge. In early 19th century, the island was inhabited by a hermit known as "The Wizard". Actual date of construction of the villa or its past history is not known however in 1920s it was owned by Hans Braun, who was murdered by some unknown persons and his body was found wrapped in a carpet. A short while later his wife drowned in the sea. Another of its owner Maurice Sandoz, pharmaceutical industrialist committed suicide in Switzerland. Another resident owner Gianpasquale Grappone suffered failure of his insurance company. Gianni Agnelli the head of Fiat had also owned the villa. His only son also committed suicide as he was not interested in his fathers business. After his son's untimely death Gianni had started grooming his nephew Umberto Agnelli to run Fiat however Umberto also died of some rare cancer at the young age of 33. Thereafter the villa remained empty. The house at one time or another was also owned by multi billionaire Paul Getty and by the Norman Douglas famous author of "Land of the Sirens", however they never stayed in the villa. Douglas considered it a cursed island, with beauty that hides restless fate. The bridge which connects it to the second islet is a thin bridge and looks like a natural arch connecting the two. However I couldn't find any information about it whether it is really natural or has been built in such a way to look natural. May be some of my readers can provide information about it. Looks like a nice place for a deposed leader to set up shop!